I recently purchased the ecobee3 lite and am now stuck trying to install them. I have 3 Honeywell thermostats I am looking to replace and my heating system is oil/hot water. My home was built in 1970 and I believe the wiring involved here is pretty old. I am not an electrician but I believe I should be able to handle this project given some help. So this box is a Honeywell Aquastat Relay L8148A whose schematic can be found here. As you can see, the main controller has 1 pair of red/white wires labeled Thermostat in the top-left corner. Then there are two transformers affixed to the furnace that also have red/white wires. I'm at a loss because most "add a c-wire" videos show a controller that has 5 different connection points, one of which is clearly labeled C, and they run a wire from there and everything works. I can't find a spot that I'm confident would be a "C" wire spot. The ecobee3 lite offers a PEK but that looks like it also requires more than just two wires to be run into it to operate properly. Many of these smart thermostats assume you are also controlling a cooling system which I am not; I only have a furnace. So my question is: Can I install an ecobee3 lite myself in this system without a ton of work, or should I just buy something like the Nest E that can power-steal from my furnace? Here's the rub -- the Honeywell L8148A doesn't even provide a C terminal for the blue wire, PEK, or whatever to connect to, as it was designed for dumb mechanical 'stats. Considering it not only contains a transformer and relay, but a high limit function as well, this leaves you with limited options -- simply replacing it with a separate transformer and relay won't do. One could add another transformer and relay as an isolation relay, but that's probably more complexity than is called for here, considering that Honeywell makes a more versatile version of what you're looking at, called an L8148J. 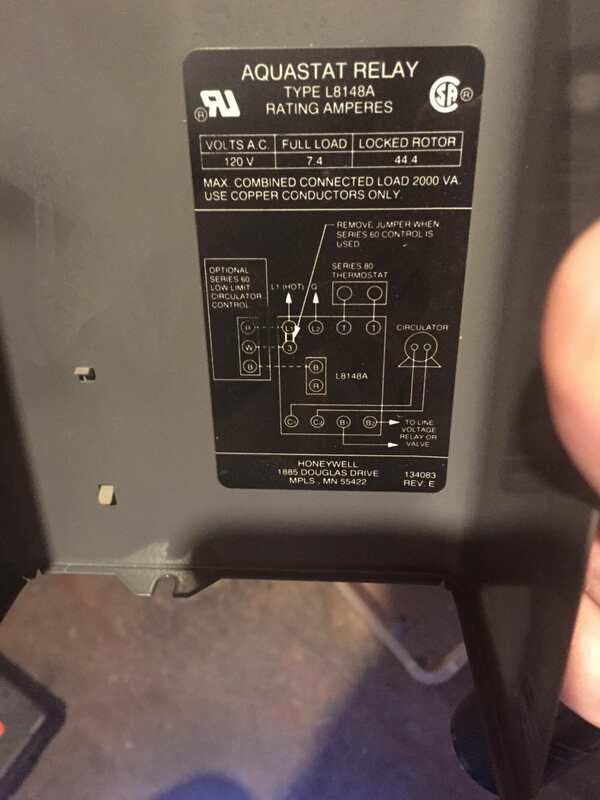 Replacing your L8148A with an L8148J configured for a 24VAC gas valve (valve from B1 to B3) lets you connect the C wire to the TV terminal, jumper T to TV, and then pull the jumper from Z to W, connecting R to Z and W to W. Of course, this all presumes that the cable doesn't transition from 3-wire to 2-wire somewhere in the middle; if it does, then you need to use a PEK or add-a-wire device to handle the situation atop the aforementioned aquastat changeout. If you can't find the blue wire, then the next best thing the Ecobee's Power Extender Kit. Every Ecobee thermostat comes with one. Ecobee provides excellent installation support. If you can't use their included instructions to install the Power Extender Kit, then you should call them. 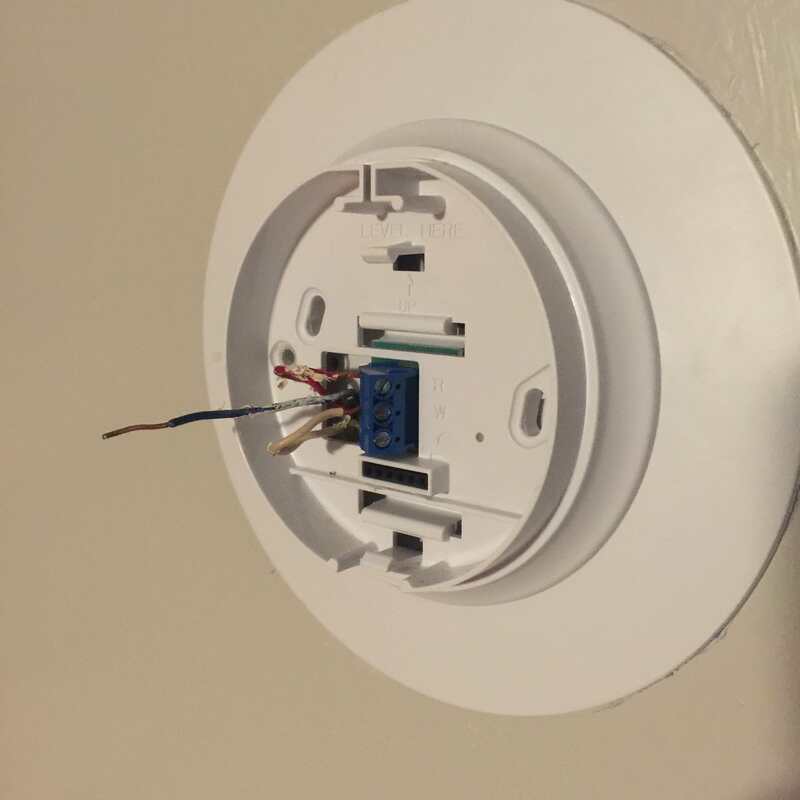 You will want to wire your thermostat with three wires, called R, W, and C. Red is "supply voltage", White is "calling for heat", and Common (often blue) is a ground wire, allowing the thermostat to receive power even when the R-W circuit is switched off. Old-style thermostats are, electrically, simply a switch that connects R & W, which are connected to terminals on your aquastat. So R&W are interchangeable, which is why they're both labeled T/T. For your new thermostat, it expects to have 24VAC potential between R & C. When calling for heat, it will connect R & W. So you need to identify (using schematics and/or a voltmeter) which of the two T/T terminals you should connect to R, which to W, and where on your aquastat you can connect C. If your board doesn't have a convenient terminal for C, you may need to splice into one of the output legs of the 24VAC transformer. Once you have a theory of how to do that, it's easiest to try it in the basement standing next to your boiler/aquastat relay. Shut off power to the aquastat relay, wire up the ecobee sitting there in the basement, and then turn on the aquastat. If the ecobee boots up properly, try turning the heat on and confirming it activates the aquastat (you should hear the aquastat relay click, and a circulation pump should turn on). Now you know how things should be wired, and you need to figure out how to connect the cable. maybe use a common maker or isolation relay, depending on the availability of space, power, and the common maker's requirements (for your case I think you're right that the ecobee PEK won't work, but something like the Fast-Stat Common Maker might). My first step would probably be to check the cable - if it's relatively easy to pull some new thermostat cable through, that's probably your best option. If you can't get a 3-wire bundle between the aquastat relay and this thermostat, then consider things like the common-maker or a power-stealing thermostat. Not the answer you're looking for? Browse other questions tagged wiring hvac heating thermostat thermostat-c-wire or ask your own question.